The United States economy is now enjoying strong economic growth, the likes of which hasn’t been seen in years. The employment rate has declined to under 5%, hiring remains strong, wages are rising, and the stock market has reached historical highs. Yet while Apple, Google, and other big brands are dominating the headlines, small businesses are also enjoying a boon. With the economy set to expand, the most competitive and proactive small businesses are also going to be expanding their operations to meet rising demand. Small businesses are vital and as the economy evolves, they will only grow more important. There are an estimated 28 million (and growing!) small businesses in the United States. These businesses produce approximately half of America’s gross domestic product, and employ 56 million people, or roughly 57% of America’s working population. They also pay out roughly 44% of the nation’s total payrolls and account for 26% of exports. No matter how small the business, it’s an important contributor to America’s national economy. Quite simply, small businesses are the backbone of the United States. Yet despite their immense importance, many small businesses struggle to secure loans. Banks have long shunned small businesses due to their small size and the high risks involved in lending to them, while finding investors can be difficult. Meanwhile, relying on family funds carries with it a lot of personal risks. 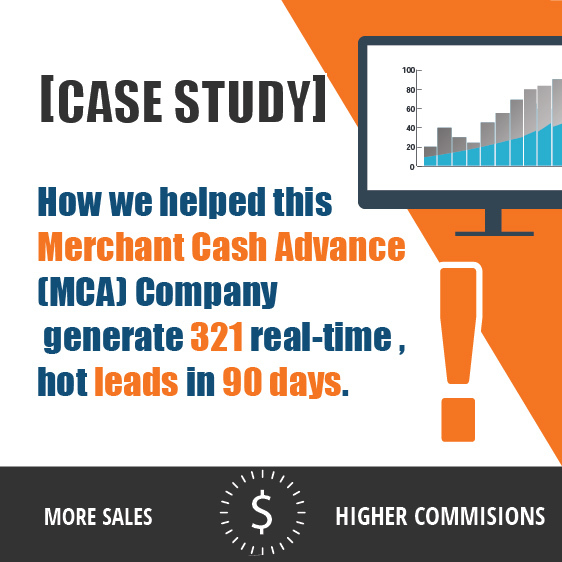 The Merchant Cash Advance (MCA) industry has emerged as a popular alternative to traditional bank loans. Now, with the small business sector set to enjoy unprecedented prosperity in 2017, cash advances will play an increasingly vital role in helping small businesses secure funding. 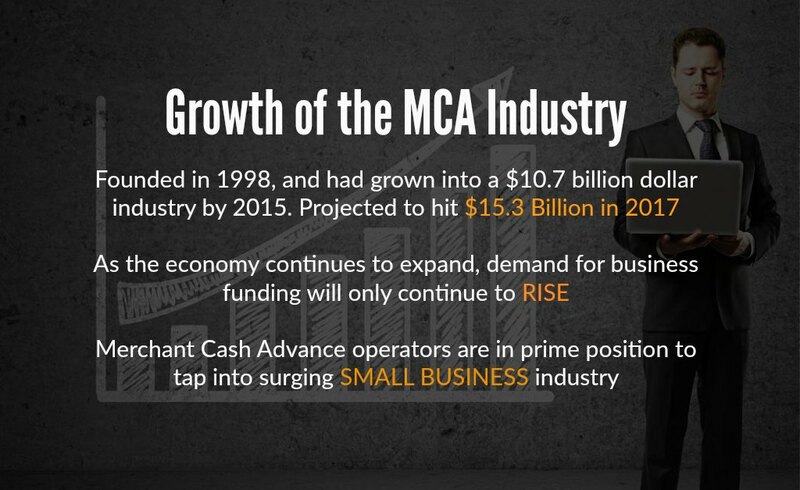 Let’s dig into the small business boom that America and the rest of the world could enjoy in 2017, and explore how MCA’s can tap into this potential growth. Cash advances are not loans. Instead, you sell a portion of your future sales. Cash advance companies can often work with companies struggling to secure a bank loan. Payments are often more flexible as they are based on sales. Many small businesses struggle to secure loans from traditional banks. In fact, 16% percent of small businesses never even bother applying for loans out of fear of rejection. Meanwhile, 70% of those approved for funding fail to secure the full amount of funding they need. If you’ve been rejected for a loan, or are having trouble finding funding, you’re not alone. Experts estimate that there is between $80 to $120 billion dollars in unmet demand for business funding. When it comes to securing a merchant cash advance, businesses are far more likely to be approved. Why? First, a cash advance is not a loan. Instead, a business will sell a certain portion of its future sales, usually credit card sales, to a merchant cash advance firm. Since “repayment” is based on sales, this also means that businesses don’t have to struggle with inflexible loan terms. Further, merchant cash advances can often be extended to newer businesses, or business owners with bad credit rating. Banks frequently reject these applicants. For many, a cash advance represents an ideal way to raise cash. Approval is much more likely and you’re more likely to secure the amount of funding you actually need. The economy is enjoying incredible economic growth, having expanded by 3.5% in the 3rd quarter of 2016.
Business confidence is growing, so many companies will be aggressively expanding this year. Business investment is already trending upwards. Those businesses that don’t invest in themselves run the risk of falling behind. 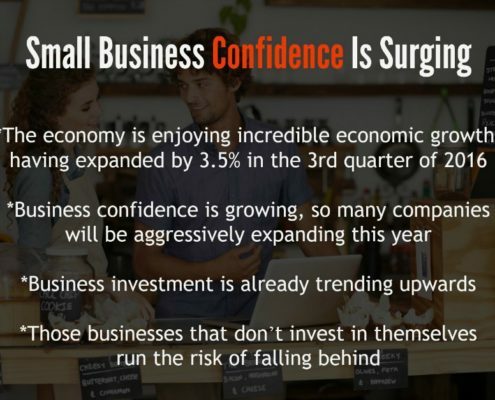 If small businesses owners feel optimistic about the economy and growth, they will be far more likely to expand, upgrade, and invest. Fortunately, the small business optimism index skyrocketed to nearly unprecedented highs in December of 2016, reaching 105.8 points. Such numbers haven’t been seen such 2004, years before the financial crisis nearly destabilized the global economy. Digging into the numbers, there’s even more good news. 23% of small business owners believe that now is a good time to expand. Of course, most small businesses don’t have the cash on hand to fund an expansion by themselves, and will instead have to rely on external funding, such as a cash advance. 16% of businesses expect to expand their staff. Not only will increasing payrolls potentially require funding, but it’s also proof of the health of small businesses. Companies don’t expand staff unless revenues and opportunities justify the expansion. Meanwhile, 31% of businesses anticipate higher real sales. For merchant cash advance providers this is especially good news. 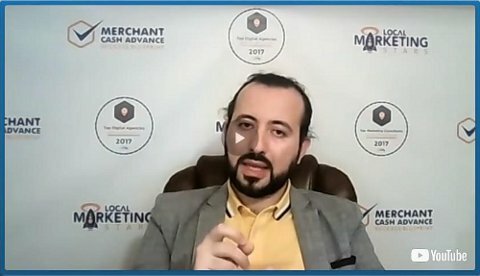 Since MCA’s are essentially purchasing future sales, rising sales will result in increased payments. Given this surging confidence, it should come as no surprise that business spending also increased in 2016. The United States Commerce Department revised third quarter growth upwards from 3.2% to 3.5%, owing to stronger than anticipated business investment. Spending in capital goods also increased increased .9% in November of 2016. Capital spending is closely watched as a proxy for business spending and strategy, as companies generally spend on expensive capital goods when they are expanding operations, or undertaking expensive retoolings. On the whole, most business-side indicators hint at strong growth through 2017. Many business owners and investors are also expecting President Donald Trump’s pro-business policies to create even more opportunities for entrepreneurs and small business owners. Quite simply, the time is now. Consumer spending drives the economy and many small businesses. Consumer confidence indicators has reached highs not seen since 2001. Consumer spending makes up roughly 67% of the American gross domestic project. This makes consumer spending the largest single contributor to the economy by a wide margin. Many small businesses are especially reliant on consumer spending. In fact, grocery stories, saloons, restaurants, and numerous other businesses are all but wholly dependent on consumer spending. In the final days of 2016, consumer confidence surged to historic highs, reaching levels not seen since 2001. The Consumer Confidence Index reached 113.7 in December of 2016, blowing past already optimistic projections of 109. Not since August of 2001, long before the Great Recession scarred American consumers, had the index produced such high readings. Not only is general confidence on the rise, but consumers specifically cited prospects of a strong labor market and continued economic growth in 2017. When it comes to consumers and the economy, strong confidence can create a sort of self fulfilling prophecy. 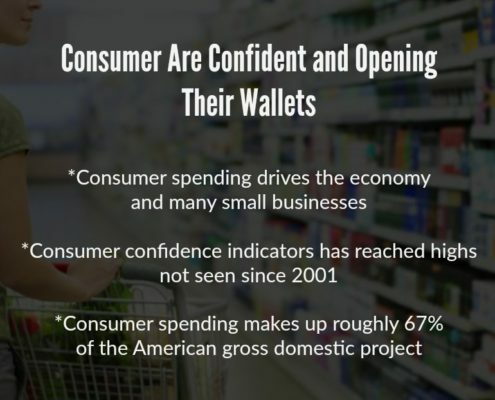 As consumers feel more confident about they economy, they become more likely to spend, and as they spend, the economy grows, which in turn can make them feel even more confident. 2017 is primed to be even better. As already mentioned, there are 28 million small businesses in the United States, accounting for 55% of all jobs. While perceptions sometimes suggest that small businesses are dying out, the sector has, in fact, been growing. In fact, 66% of all net jobs gained since the 1970’s have been in the small business sector, and the number of small businesses created since 1982 has increased by an estimated 49%. Since 1990 big businesses eliminated approximately 4 million jobs, while small businesses expanded by 8 million. Not only does expanding staff require funding, but these numbers suggest that the small business sector will continue to grow and play an increasingly vital role in the economy. Businesses that can provide services to small businesses will be in a prime position to enjoy this growth. Small businesses currently account for 54% of all sales in the United States, these numbers may actually expand in the years ahead. The continued development of the World Wide Web, emerging technologies such as 3-D printing, and various other factors should propel the growth of the small business sector. Increased demand for hand-made craft products, locally produced foods, on-demand manufactured goods, and small business goods and services should help propel the further growth of the small business sector. Further, while small businesses already account for 26% of exports, continued advances in communications technologies and the shipping industry suggest that small businesses will be able to more easily participate in the global economy in the years ahead. All of these headwinds combined suggest that small businesses could actually increase their share and participation in the global economy. Inc. identified accounting services, IT support, business consulting, architect firms, and specialty grocery stores as the five top industries for entrepreneurs to start their own small businesses. Entrepreneur found that dentists, legal services, and health care offices are among the most profitable small businesses. Dig around a bit more on the web, or better yet take a ride around town, and you’ll find literally limitless opportunities. Mom and pop coffee shops, artisan restaurants, personal services, the small business industry is ripe with opportunity. And while big name brands like Starbucks once held strangleholds on markets, many consumers now prefer to shop local, and authenticity is currently a big selling point. Many of these businesses are going to require funds both to start and to expand. Specialty grocery stores are becoming very popular in many cities, but building inventory, expanding storefronts, and launching advertising campaigns isn’t cheap. The same is true for health care offices. Many practitioners often start out on their own or with a very small staff but as they grow, they need to expand their staff. Banks are often hesitant to work with these small businesses. Many of them are young, or even startups, and thus aren’t eligible for bank loans. Meanwhile, businesses face the risk of being pushed out of the market by competition if they are unable to secure funding. The Merchant Cash Advance sector is already a large and growing industry. When you apply for a merchant cash advance you’ll be tapping into a multi-billion dollar industry that has already helped countless businesses expand and grow. 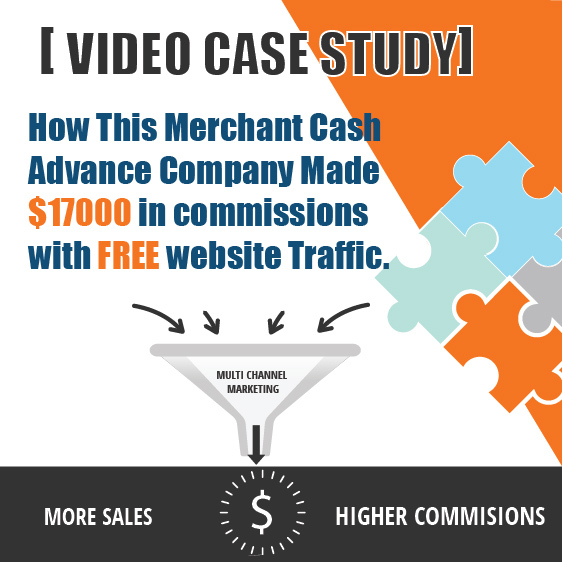 The Merchant Cash Advance industry was founded in 1998, and had grown into a $10.7 billion dollar industry by 2015. It is projected to hit $15.3 billion in 2017. As the economy continues to expand, demand for business funding will only continue to rise. 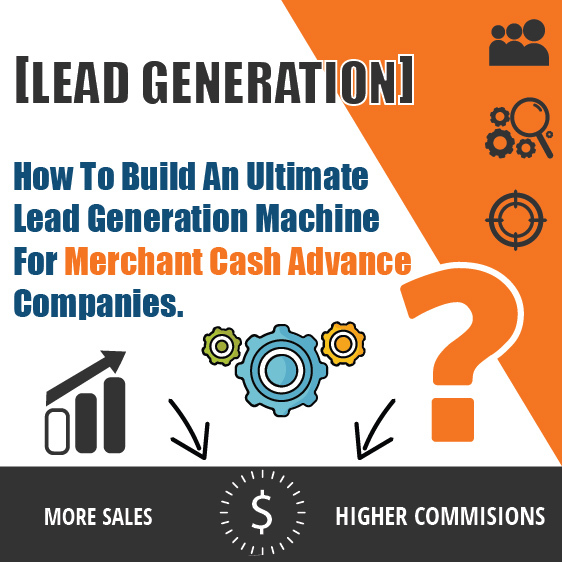 Merchant Cash Advance operators are in prime position to tap into surging small business industry. 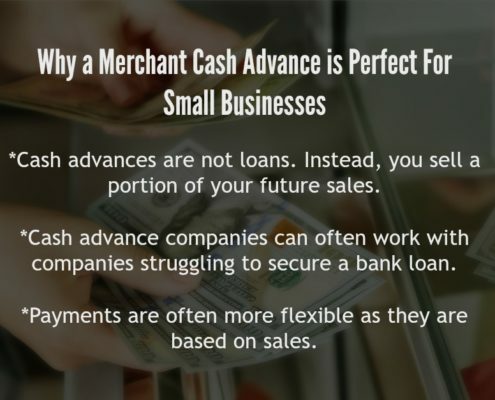 Merchant cash advance firms can provide businesses with the funds they need to expand. Since a cash advance is not a loan MCA’s can be extended to many companies that would not qualify for loans. This makes cash advances perfect for younger companies, business owners with other bad credit, companies working in higher risk industries, and numerous other companies that have trouble qualifying traditional loans. The economy is expanding, and 2017 could be a big year for small businesses. Business investment, consumer spending, consumer confidence, across the board numerous indicators point to expansion. While the future is always uncertain, savvy small business owners are already expanding and tapping into rising demand. When it comes to raising capital, a merchant cash advance can provide just about any small business with the funds it needs to expand. The time to invest is now. Businesses who wait run the risk of missing out on opportunities, chances to produce more profits, and to secure a more dominate market position. Hesitant companies could even be pushed out of the market.